My father was the Commanding Officer of LCI(G)-472 and provided close-in fire in support of UDT activities at Guam and Okinawa. I am researching activities of the 472 and sharing with families of crew members. Any information that anyone has concerning these activities would be greatly appreciated. My father, Eugene Remisiewicz was Gunner’s Mate Third Class in UDT 26 from 1944-1946. Originally from Detroit, Michigan, he did his primary Frogman training in Fort Pierce, Florida. 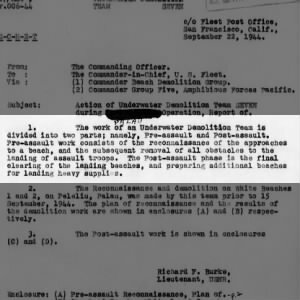 Location of service: Great Lakes, Illinois; Patuxent River, Maryland; Fort Pierce, Florida; Maui, Hawaii; Guam (Mariana Islands); Yokosuka, Japan; China; Pacific Theater. He did an oral history for the Veterans History Project. Dad (still going strong at 90 years old) and I are working on a project to identify a series of photographs he has in a scrapbook. He has a brick in the walkway at the UDT/Seal museum in Fort Pierce. My wife’s uncle, Floyd William Spearin served with UDT #7, UCDU 122, “Higel’s Top Notch Terrors”. He was in several actions in the Pacific and was one of the first to set foot on Okinawa after the shelling, but before the invasion. His unique story is told in “The BLAST”, 2nd quarter 2005, Vol. 37, No.2. Journal of Naval Special Warfare. She wrote his unique story about this event. I believe his fellow team members identified so far were: Clyde V. Higel, Commander; J. P. “Pete” Peterson; Roy Gartrell; Herman Graff; B. F. “Andy” Anderson; T. L. Grass; Chief Richardson ; Pertison; C. E. Kroenke; W. O. Morrow. His story came full circle when she made contact in 2004, for him, with Okinawan’s who survived the invasion and returned their family photos he had found in 1945, on the beach. She will share any information with other UDT families. That was my father’s team, so any further information would be appreciated. He did at age 38, and even though he talked more about his experiences than many did, there’s still so much I’d like to know. I think my dad was in a NCDU in the European theatre. He used to say that he was involved in every invasion before d day. I know that he was on the USS Ancon. How can I find out more about what he really did? He never told much about the war itself, only funny stories about shore leave and hints about actual combat. He enlisted in the navy in the summer of 41 and was in until the fall of 45. He died in 2003 and I would like to get more detail to share with his grandsons. Does anyone know anything about UDT13? I believe that is the info I received from my father-in-law. My 3rd ggrandfather, Daniel Davidson, was one of the Virginia mountain men who fought in the battle of King’s Mountain. He then fought in the Revolution in 1777 in Col. Morgan’s Riflemen, CO. D. Also fought in Capt. Charles Porterfield!s Company of 11th Virginia Regiment. He was still serving in 1780.